Learn how to send a WhatsApp message to all or multiple contacts at once. There is, however, a WhatsApp broadcast limitation that is in place to discourage spammers. WhatsApp is the new age method of easy and quick communication. WhatsApp is being used in hundreds of countries and by speakers of thousands of languages. The mobile app is easy to use and provides a host of useful features like Last Seen, use on PC, chat emoticons, read receipts etc. One such feature is WhatsApp Broadcast. This feature allows you to send a WhatsApp message to all your contacts. I have been getting such messages on WhatsApp which seem to be one-made-for-all types. I knew that there must be a broadcast or bulk message feature in WhatsApp but I never bothered myself to look for it —well, after all, even without such explorations we waste a lot of time on WhatsApp anyway! But yesterday when someone in office asked me if it was possible to send a WhatsApp message to multiple contacts, I decided to look into the matter. And I didn’t need to look too deep! WhatsApp Broadcast is very intuitive feature. Let’s learn how it works. With WhatsApp, you can send message to all or multiple contacts in one go. OK, first of all, let me clarify, that you can not send a WhatsApp message to all in one go. There is a limitation on WhatsApp Broadcast, it allows broadcast only to those people who have your phone number saved in their phonebook. This has been done to ensure that this feature is not used for spamming. Now WhatsApp will open the message screen with all the selected contacts added as the recipients. Type the message and send it. Easy! This broadcast list will be saved like any other chat conversation. You can open this list and send more messages in future. If you need to remove or add contacts in an already created broadcast list, you can do so. Yes, it’s a good question. 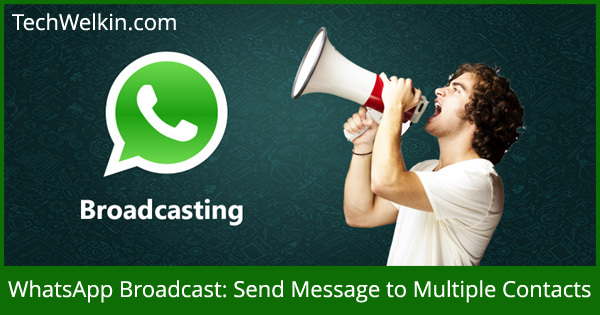 If you have used groups on WhatsApp, you may ask how WhatsApp Broadcast is different from WhatsApp Group! Well, the difference lies in anonymity. In WhatsApp Group, all the members know who are the other members of the group. Therefore, every group members know who all would receive a group message. On the other hand, recipient list in WhatsApp Broadcast remains private. Recipients don’t come to know who else has received the message. Each list member receives your message as though it was sent only to him. In email analogy, WhatsApp Group is like using CC (carbon copy) option. Whereas, WhatsApp Broadcast is like using BCC (blind carbon copy). Go on! Open your WhatsApp and send your first broadcast message to all your friends! Should you have any question in this regard, please feel free to ask me through comments section. I will be happy to try and assist you. Thank you for using TechWelkin! how do i order my contacts on the boradcast list alphabetically? Iphone does have contacts arranged alphabetically but they appear multiple times in the list.. Contact – Lalit Modi will appear in “L” and in “M” as well..
numbers get added multiple times in different boradcast lists. Go to Settings > Contacts in your iPhone and set both Sort Order and Display Order to First, Last. Try this, it may solve the problem. i have a very important query : i have a group in phone book with around 200 numbers, Is there any way that i can import all of them to any whatsapp group in onego. the option for forward messages to broadcast list is available on phones other than iPhone. I am not sure of how to do this on an iPhone? any advise? Hi Any option availble for Export whatsapp group contacts?? what will be the no of contacts can be addressed in one go while broadcast a message? Is it possible to create whats app groups thru an API, or a excel sheet.. I have 10000 mobile numbers who I will have to add to multiple group as one group only has 256. So that’s close to 40 groups .. it there any way except to create each group manually? Also I read in your chats that in a broadcast message is only delivered to those who have saved your number in their contacts? Is that correct? Hi Swati, an API based WhatsApp group creation is not yet available. And yes, broadcast message is delivered only to those who have saved your number in their mobile phone. Hi, is there any way to know if the receiving device has my phone number in it? ?I have been sending broadcast messages and I thought it is time for a clean up. I would like to delete those numbers that are not receiving my WhatsApp messages. There is no difference between copy-pasted messages and typed messages. I’ve been an active user of broadcast on my Nokia Lumia 535 Win.8.1 ever since I installed it a year ago. Never did I face any issue until now. The problem is with sending of IMAGE(S) via broadcasts. Currently using version 2.14.16. PROBLEM: Images sent via broadcast are not being transmitted. But text messages are through. Had tried contacting ‘whatsapp support’ with screen shots, etc. but their auto-response response suggests me to read the FAQ (which I already have but no mention about my current crisis). # Tried re-installing the app a no. of times. # Deleted & re-created the broadcast list. # Noticed that this is occurring only with a certain list. # Latest version says something about encryption (end-to-end) and notifying me that some of my contacts are not having updated versions, etc. Are these the issues? HELP!! Simply because, I’m using this feature since 2015 with no issues at all, do have 200 odd subscribers, missing my graphics with only the texts being transmitted. Thanks in advance. Why can’t we send a message to more than one broadcast list? Why either one group or one broadcast? If I prepare broadcast list, how will I come to know who have received the message and who have not? Is it by clicking on message and then on (i) button ? Is there any other way to send message to multiple recipients on whatsapp who have not saved my number (other than forming a group)? When I add someone in broadcast list, will they know that I added them in broadcast as group chat? Broadcast and group chat are two different things. But when you add someone in broadcast list, the added person will not get any notification about it. Hi AM having issues sending images on broadcast list. its been 2 months now it is having issues. Earlier it was working but these days it fails to get deliver. It just keep on trying and then fails. My broadcast message not delivered to all persons. Please help and give your opinion. The only known reason for WhatsApp broadcast message not delivering is that the receiver has not saved your phone number in their phonebooks. But apparently there are other reasons as well. At present we can not say for sure what could be those reasons. In Broadcast only the person who saved our number can receive the message where as in group you can send to any one but problem is privacy..In group all recipients will be open. So any other way to send messages to multiple recipients in the list without group of broadcast list. I am in advertising business. Kindly suggest me how we can send advertisements to whatsapp numbers in a particular geographical area commercially. Dear Satyadev, you’re asking me to help promote spamming. WhatsApp is not an advertising platform. Only Facebook, the owner of WhatsApp, can turn it into one. But until they provide a proper advertisement facility, all attempts to send unsolicited information on WhatsApp would be called spamming. And a breach of WhatsApp users’ privacy. You can not add WhatsApp groups in broadcast list. I have a WhatsApp distribution list with members all having my phone number stored in their contacts. But for some reason some people don’t get the message delivered to them. And it gets delivered to others. What is the reason for this and how can this be rectified? Some of the recipients who want my messages were asking me. Is there anything I can do or something that the intended recipients can do to ensure they get the messages? Hello Palak, those who do not have your number saved in their mobile phone will not receive your WhatsApp broadcast. And if you’re seeking a get around solution, it might actually be bordering on spamming! :-) WhatsApp is not meant for spamming unknown people. Hi Lalit, My number is saved to the receiver mobile phone. Yet, there are some persons who don’t receive my broadcasts message in whats app despite the fact that my number is their in contacts lists. If I send them individual messages, they receive it. Can you suggest what can be the issue. I am using iPhone 6plus. Nitin, we don’t know why exactly it happens because WhatsApp has not given us any clue. The only certain condition we known about is that your phone number must be saved in the receiver’s mobile. Another possibility is that there is a limit of about 250 contacts in a broadcast list. If your broadcast list has more receivers than the limit then some of the receivers may not get you broadcast message. These are just guesses. The problem could very well be with the WhatsApp server! I can send message which I myself write in your suggested way, and also send video or photo by clicking on CREATE option,or by clicking on attachment sign,and then going to gallery. But I can’t send rather forward a message which was sent to me by some of my WhatsApp friends to a WhatsApp Broadcast. Would you kindly suggest me the way? You may not be able to forward a WhatsApp message to a broadcast list. You will have a create a message. But you can copy a message and paste it while creating a new message. Then you should be able to send it to your broadcast list. I am unable to send broadcast messages to the people who have already saved since last week, my number in their contacts. I have almost 150 people in my Broadcast list out of that only 120 are able to receive it rest of them r not able to since last week , before that all of them were able to receive . I already confirmed as they have saved my no. too. Plz Help. Hi Jalees, as 120 people in the broadcast list have got your WhatsApp message, it shows nothing is really wrong on your side. There could be any number of reasons why the other 30 people did not receive the message. And I guess, mostly it will be related with their phones or network. I am unable to send broadcast messages to the people who have already saved since last week, my number in their contacts. I have almost 235 people in my Broadcast list out of that only 120 are able to receive it rest of them r not able to since last week , before that all of them were able to receive . I already confirmed as they have saved my no. too. Plz Help. Does recipient(s) have to have Whatsapp installed to view video message?? WhatsApp has to be installed on both sides. Yes, it indeed sounds very weird :-) Sorry, but I can not offer an explanation! Hi Lalit. I am facing a problem in WhatsApp. I have 8 broadcast each contains 70 contacts most of them saved my number but still unable to receive my message. Please suggest what can be done to send message to all of them. Hi Payal, those who have not saved your number in their phones, will not be able to receive your broadcast message. Can I send msgs to a group of contacts , who don’t have my contact saved ? If you’re part of a WhatsApp group, then the message sent to the group will be delivered to all members irrespective of whether they have saved your number or not. There is nothing to clarify :-) Now that the broadcast list has been created, just open the list, type the message and press send button! It works exactly the same way as you send message to an individual recipient. My mobile display screen showing blank (white). Is it possible to copy contacts from it to another cell? Yes. Contacts in mobile phones are saved either on SIM card or on SD card (also known as memory card). Just take out both these card from the existing phone and insert them in another phone. You’ll be able to see and copy all the contacts. Can a person come to know if we add or remove him from our broadcast list? No, a contact does not come to know about addition unless he gets a WhatsApp broadcast message. Hello, I sent a broadcast message to 85 persons. I was surprised to know that most of them didn’t receive my message. What was the problem and why they didn’t receive it. Please advice me what to do in order for them to receive it. I am sorry Marianne, it usually does not happen. Most probably, it was just one off incident. But if it is repeatedly happening, there is something wrong with your mobile Internet connection or WhatsApp installation. Sometimes it’s difficult to suggest a specific solution without actually having the device in hand for tests. 1. The sender number has to be saved as a contact on the receiving device. 2. If the number is not in the receiving device, the broadcast message will not be received. 3. Any reply made on the broadcast will appear to the sender only. No other broadcast receivers will be able to see the reply. It’s nothing. The problem is that when you send the message, the receiver must connected to Internet through 2g or 3g/4g etc. Most of the people connect to the mobile Internet connection only when they want to use it. That’s the reason they don’t get the broadcast message immediately. Thank you for your detailed guidance. i would like to help my father in managing messages to his clients through WhatsApp Broadcast. But before getting started i would like to know as how i can send messages to as many as 2000? would be thankful if you could find a way for me. Hi Nithya, you can include a contact in WhatsApp Broadcast only if that contact has your phone number saved in their phone book. If all those 2000 people have your father’s number saved in their phone book, I guess you can send them all a WhatsApp Broadcast.